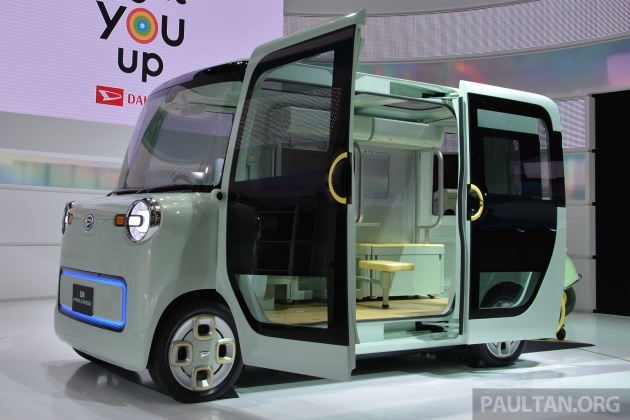 On the surface, it might seem that Daihatsu’s 2017 Tokyo Motor Show concepts are just cute flights of fancy, the sort of showcar that’s a must have at the Japanese show. But no, each one has a sound concept behind it, whether for Daihatsu’s overseas markets (Malaysia and Indonesia) or at home, where it leads the kei car segment. Japan has a rapidly aging and shrinking population, the result of low birth rates and increased life expectancy. 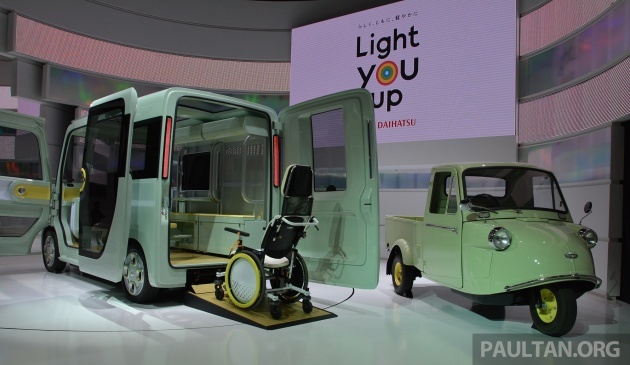 Daihatsu has two concepts with seniors in mind – we’ve already seen the stylish retro four-door coupe that’s the DN Compagno, conceived for “active seniors” who like to enjoy “individual lifestyles”; here’s one for seniors that aren’t so lucky. The Daihatsu DN Pro Cargo is a work machine, a compact commercial electric vehicle that’s easy to use for both seniors and women. This is thanks to its low, flat floor that results in a vast interior space, and a variable cargo space. Besides easy ingress and egress via the barn doors, one can also walk through this kei car’s 1,600 mm tall cabin. Daihatsu says that the two-seater DN Pro Cargo features a highly customisable multi-unit system that can be changed to suit a wide range of industries and uses. Like the DN Compagno exhibit, the Pro Cargo is also being shown with an old timer. The cute little thing you see here is the classic Daihatsu Midget that was launched in 1957. Prior to this, I’ve seen it being used as a prop in shops (possibly a Village Vanguard and in Osaka’s Dotonbori) and you might have too. Daihatsu says that the DN Pro Cargo inherits the ease of use and scalability of the Midget. “A new best buddy for your own style of working,” that’s the Daihatsu DN Pro Cargo.